The cathedral of Ziguinchor risks collapsing; "Why don't the authorities start safety measures?" Dakar (Agenzia Fides) - "We must complain about an increase in violence following the tragedy that occurred in January", said His Exc. Mgr. Paul Abel Mamba, Bishop of Ziguinchor, capital of Casamance, southern region of Senegal, in his homily on Easter Sunday, where there has been a "low intensity" war for secession since 1982. The drama which Mgr. Mamba refers to is the killing of 13 young loggers on January 6 near the village of Boffa-Bayottes (see Fides 8/1/2018). 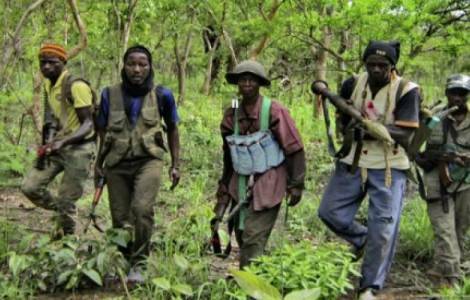 The massacre was attributed to some members of the secessionist movement, the Mouvement des Forces Démocratiques de Casamance (MFDC), which however rejected the accusations. Since then, as Mgr. Mamba denounced, tension in the region has increased. On March 29, a 33-year-old man was killed and two others were seriously injured in a robbery on the Ziguinchor-Oussouye road, committed by armed men. Two weeks earlier, armed men had spread terror in Kaguitte, in the County of Ziguinchor, and a woman was held hostage. "We have the impression that we are moving backward because there was an appreciable truce that encouraged dialogue to proceed towards peace", said the Bishop in his Easter homily. Mgr. Mamba invited the government and armed groups to dialogue "because violence has never solved anything". "The most powerful armies in the world have never managed to impose peace with force. It is only through dialogue, by listening to one another, and by reaching compromises that peace can be achieved", he stressed. Mgr. Mamba concluded by asking the faithful to intensify prayer to ask for the gift of peace in the region. Since 1982, the MFDC has been carrying out a "low-intensity" war for the secession of the region from the rest of the Country. After several attempts of mediation and division within the secessionist movement, in 2017 the peace talks seemed to have made progress with the faction of the MFDC led by Salif Sadio. AFRICA/CENTRAL AFRICA - Central African Bishops denounce: "Some UN contingents do not protect civilians"